After In Tränen unendlicher Lust1)The remaining text has been co-authored with Wivine Decoster. Yves Knockaert is professor of philosophy of music and contemporary music at the Lemmens Institute in Leuven. He was director of the Institute for Practice based Research in the Arts at the KULeuven Association (2006-2010). In 2011 he started a PhD in Musicology: analysis of Wolfgang Rihm’s instrumental music. Wivine Decoster is a doctor in Speech Language Pathology and Audiology. She is senior professor in Logopedische en Audiologische Wetenschappen (Speech, Language and Hearing Sciences) and a researcher at the voice lab of the medical faculty of the Catholic University of Leuven. In her teaching and research she focuses on all the aspects of the human voice and coordinates these voice-related activities at the Centre of Excellence for Voice (Expertisecentrum Stem). The romantic lied conjures up an image of a singer in a dazzling dress standing rigidly next to a piano, with the pianist in a suit, or a lady pianist in an equally striking dress. At best, the colours and style of their attire are somewhat harmonious, although this is not necessarily a requirement. The singer (male or female) keeps his or her hands immobile, places them on his or her thighs, leaves them hanging along the sides of the body, or folds them together. A sober gesture or facial expression is sometimes used to emphasize the content of the performed song lyrics, although this is not really necessary, for it is only the music that really matters. Whereas the romantic lied has evolved in the musical field outside of classical music circles, it enters into a comprehensive whole comprising song, dance, video, fashion, and social behaviour, and has become a public favourite, and a well-conserved museum piece. Excellent interpreters, vocalists who are lied experts and pianists who specialise in accompanying lied all seem equally comfortable with merely performing the music itself, and with the position of the genre and its conventional setting. Mezzo-soprano Lieve Jansen had been pondering for quite some time what she could do to confront her students, young people of today, with an eclectic interest in many musical genres and with the Romantic lied in a contemporary, interesting way. This was not only a question in its own right, but a consideration that included the listener as well. Is it possible to present the lied in a contemporary manner, and yet captivate an audience? Is it possible to formulate answers beyond the obvious usage of visual effects, such as lighting, accessorised costumes, and staging? Can a solution be found that does not necessarily imply dance? She found much support through the sharing of these thoughts with her colleagues. The research question was focused on the visual presentation of the lied, based on its intrinsic qualities, as opposed to the artificial addition of external effects. From the outset, Lieve Jansen considered collaborating with the fine arts field for the visualisation of these intrinsic qualities, ranging from the content of the lyrics to the social context of the nineteenth-century lied. Jansen found her ideal research partner in video artist Wim Lambrecht. During the selection of lieder she came to notice two exceptional artist couples in which both husband and wife have made unique contributions to the Romantic lied: Robert Schumann and Clara Wieck and Gustav Mahler and Alma Schindler. This observation led to the inclusion of gender questions in the project. It was among the researchers’ primary concerns to develop the singing voice itself in the most ideal way, and to investigate whether the altered circumstances of the vocal performance would also affect the development of the voices of the participating singers. This led to the involvement of Wivine Decoster, researcher at the voice lab of KU Leuven. This formed the base for the In Tränen unendlicher Lust project. The name of the project refers to the last verse of the poem ‘Ich kann’s nicht fassen, nicht glauben’ by Adalbert von Chamisso, which is included in Schumann’s volume Frauenliebe und Leben. The gender question of the Romantic lied was not suggested by the composers originally, but by the publishers, who developed a simple, commercial definition: A lied is written for a high or a low voice, the high voice being a soprano or a tenor and the low voice an alto or a bass. Consequently, the singer’s gender can, as it were, be changed both by its function in the lied, and by its function in the poem upon which the lied is based. The poet may have written from an unmistakably male or female point of view, but this is utterly ignored by the publisher, with or without the consent of the composer. Moreover, the gender issue is complicated by the question of how the gender (M/F) of the I-subject in the poem is handled by a poet (M/F), and a composer (M/F)? This threefold M/F-relation leads to a myriad of combinations, all of which will shed different light on the lied’s gender issues. What happens when a man sings a lied based on an original poem about a female protagonist? The example par excellence is of course Frauenliebe und Leben. What happens when a woman sings a lied with a male protagonist, which is sometimes the case for Schumann’s Dichterliebe? The adoption of a transgender position has caused the singers participating in this research project to reflect upon their interpretation, and has strongly influenced the way in which the lied is performed. After discussion of gender issues with Anke Gilleir from the Department of German Literature, these questions became much more refined and more conscious of gender positioning when the singer took up his or her own position (man singing as a male protagonist, woman as a female). This will not escape the attention of an attentive audience either, even if it has not been specifically pointed out or explained. The question whether or not acoustic voice research has a place in the scope of this artistic project is indeed a valid one. In the first place, a number of reasons can be listed that not only concern this very project but also apply to virtually every research project that focuses on voices. At the same time it needs mentioning that it is highly advisable to combine laboratory research with artistic research, as voice research can prevent fatigue or injury. Voice research can show a singer why a certain passage in a lied causes difficulty, and can indicate a problem with articulation, tone formation, pitch, vocal impulse, etc. In this project concerning the Romantic lied voice research can contribute to the development of interpretation specifically. At first sight, acoustic voice research seems quite alien to the artistic content of this research project. For this research does not settle on obvious conclusions, and goes much further than merely making comparisons between voice conditions at different time intervals. Spectrographic visualisation focuses on the fine-tuning of the singing, making it a veritable interpretive research. This kind of measuring allows the mapping of physical differences between different singing voices according to a variety of parameters: Loudness and pitch range (intensity and frequency range), vocal force in the high, middle and low tessitura, flexibility of the voice, stamina, breathing technique, etc. Physical voice research also allows investigation into the individual singer’s interpretation. Indeed, the entire evolution of an interpretation can be mapped through voice research. A spectrogram is like a mirror. Without any form of concealment it translates the bare facts of sound as a product of a complex emotional, and physical activity. As an objective source of information it can play an important part in the development and/or analysis of the actual singing voice. It helps vocalists gain insight into their own performances and stimulates their development. Using a spectrogram for singing practice enables the singer to see relations that were previously unclear, or to perform at an entirely unexpected level. Once the spectrogram is understood as a mirror of the singing voice, the singer will be able to read it just like a score. As with musical notation, the spectrogram will incite an audio representation, readiness, intention, and physical realisation. The expressed sound becomes an aural image, which, like sheet music, can be varied upon in terms of vocalisation. Whilst it is of course inappropriate to show a spectrogram to an audience, working with visualised sound is a useful interpretative exercise for both researchers and singers. Spectrograms can shed light on differences between the subtle interpretive nuances of one singer’s various performances of a particular lied, or between performances of one lied by different singers. It even seems appropriate to leave behind the correct execution of the score, and have various vocalists sing the same lied together. These interpreters can stand far away from each other, thereby introducing a visual content into lied interpretation that has nothing to do with a ‘singer standing stiffly next to the piano’. Throughout their research, Lieve Jansen and Wim Lambrecht experimented with different aspects of space and image, as well as with the positioning of singers and pianists. Whilst a singer can choose to stand nearer or further from a piano, the accompanist, obviously, cannot. Considering the size and bulk of the piano, this has direct and important spatial implications. An upright piano, on the other hand, evokes a cosy domestic atmosphere. The researchers have organised numerous presentations in early twentieth-century townhouses with art nouveau influences, houses with a particular history, such as for instance the L’Ecume des jours House and Ligy House, both situated in Ghent, and a villa by Horta in Renaix. Ligy House has been uninhabited for quite some time and is in urgent need of repair. The stuccoed ceiling has come down in various places, the wall covering is ruined, the floors unstable. The selected houses served as living heritage, memento, and reference object at the same time. They recalled the nineteenth-century salons wherein Romantic lieder must have originally sounded. This is not a stage, but an atmosphere, impossible to recreate in a concert hall. Ligy House allows the audience to move from one salon to the other to listen to the next lied, or to the stairway hall wherein a lied with a dramatic turn can be presented as if it were a short play. 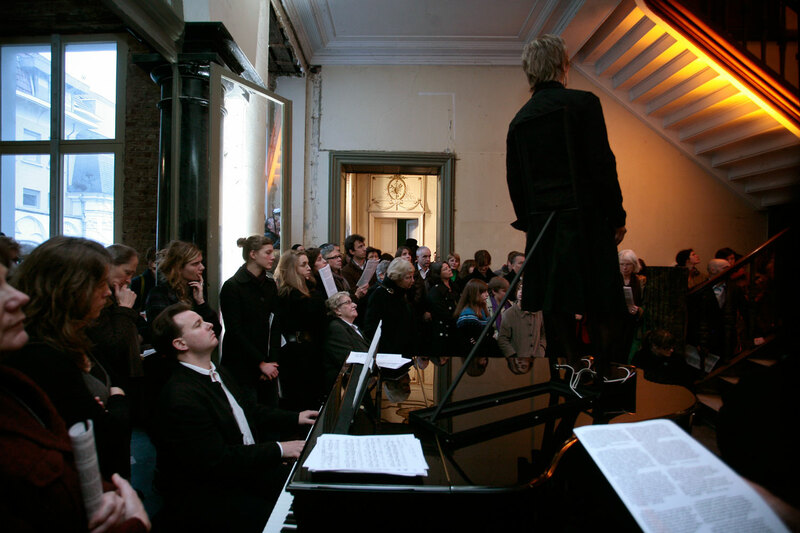 The audience is free to choose its place, more or less close to the piano, on, or under the staircase. The varying spatial positions allow the audience to adopt various approaches and to enjoy one lied at various times, each from a different perspective. The salons are furnished with antique furniture; décor as in a concert hall, which in this setting turn into authentic reminders of Romantic life, the backdrop to a literal ‘Frauenleben’, as in the title Frauenliebe und Leben. The attributes, the dramatic usage of a stairwell, and the mobility of the audience: All these elements are absent in a classical concert hall or introduced merely as exotic décor. The presentation in early twentieth-century houses makes the audience’s experience of the lied more authentic, and at the same time it is also an experimental approach insofar as the audience is active, not to say interactive with the music and the environment. Wim Lambrecht wanted to stage a few lied presentations in unfamiliar settings, such as a theatre for instance, which is quite different from a concert hall. Performing in an inappropriate space produces a strange acousticVerfremdung experience, as does standing still in an environment geared towards action. How is the interpretation of the lied affected if the vocalist stands askew, on the verge of falling over (see Figure 2)? How is the audience’s experience of the lied different when this physical act of ‘almost falling over’ is incorporated into the performance? Even more peculiar: A blindfolded singer tries to find his or her way on the stage: unable to communicate with the eyes, and with all facial expressions hidden by the blindfold. The hands are used to find the way without avoid bumping into something, rather than to express the content of the lied. Another oddity was a wide, white millstone collar choking the throat, preventing comfortable singing: a rigid image coupled to a rigid voice (see Figure 3). The ‘voice’ does not sound aesthetically beautiful, but is suffocated. As a consequence, the audience experiences the lied in a different way. Is it permissible to constrict a voice, use it as an element in an artistic research that almost smothers it? The audience’s inability to perceive what is being sung forces the listener to just listen, to become a mere ‘listener’, who is invited to elaborate his or her own visual imagery. The spectator can witness the singer being restricted by the wide collar, and hears what he sees, which is to say the voice bound by the wide collar. It is impossible to hear anything other than what is visually presented, for what is heard is the reflection of the frustration of being bound, the inability to free oneself. The singer is led to an unprecedented experimental interpretation of the lied, precisely because of the theatrical intervention. This approach also yielded unexpected results for the research project. This is the very first time I presented the lied in a theatrical context. This time, the visitor will look the lied straight in the eye. More thought is going into how the lied will leave the body. Since the theatre setting was chosen, we will be confronted with the absence of ‘resonance’. This space is conceived for the speaking voice. The singing voice will be subjected to exhausting and physical circumstances. Paradoxically, this brings a different, intimate kind of drama to the foreground, with its artificiality being enhanced by scenery, lights, costumes, and attributes, all the quintessential elements of stage play. Will the lighting sing to the lied? Will the voice become a chiaroscuro? Will the singer draw traces of light next to traces of shadow? Will there be space cleared within the darkest corners of this performance where memory can touch upon the body of the lied? How much time does one need to look through the darkness, make the gaze waver, and stray off into what was and what can be expected? After these experiences, theatrical elements and situations also appeared in the salon settings of the townhouses. A singer walks over to a large mirror and sings a lied in front of it. 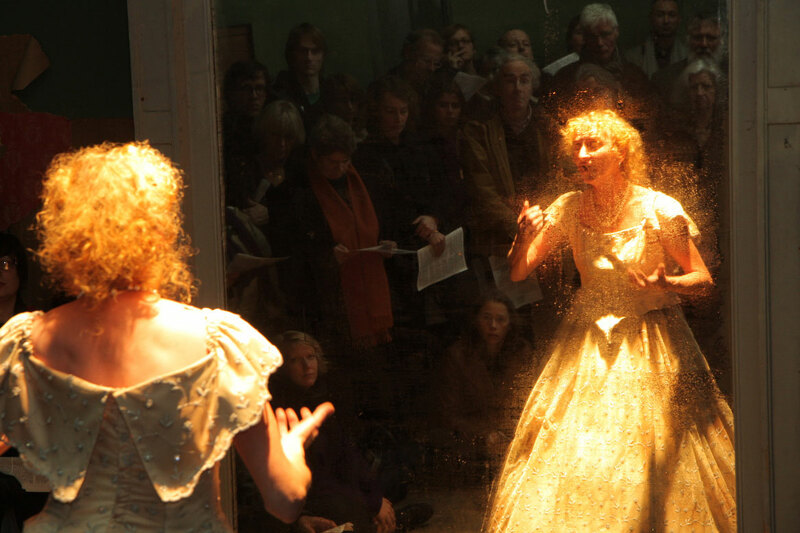 He or she is permanently confronted with him/herself and with the audience in the mirror, whilst the audience only sees the singer’s ‘expressive’ back. Depending on the audience member’s particular seat, they might also see the expressions of face and hands in the mirror. Moreover, when the audience can see itself in the mirror, they watch themselves listening to the lied (as depicted in Figure 1). As a video artist, Wim Lambrecht has explored his own medium to find solutions to the presentation of lied. The unconventional visual presentation of the lied through the utilisation of video equipment in early twentieth-century houses has brought audiences into new situations in which lieder can be experienced. 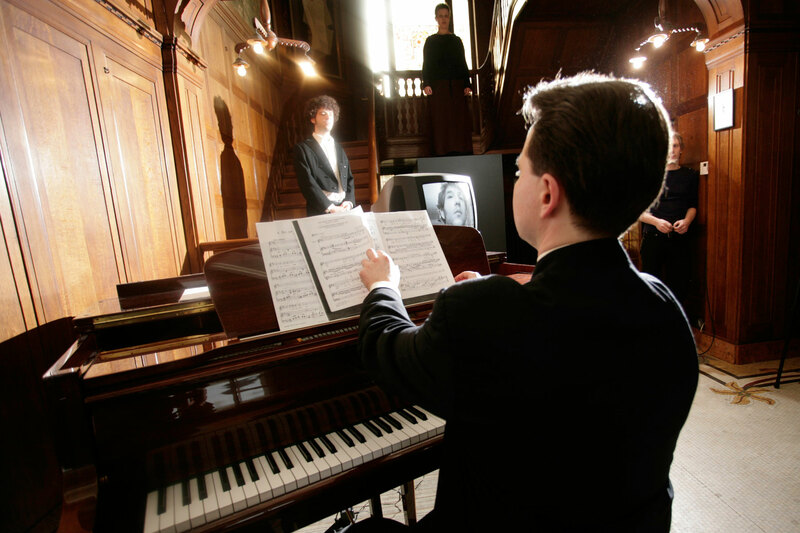 By means of camera usage and live on-screen projection of recorded images in one room, and microphone recording and projection of recorded sound in another, it was possible to separate the singer and the piano from one another (see Figure 4). The spectator had to make choices: The live experience of the piano implies seeing the singer on a screen and hearing the singing through loudspeakers, or perhaps faintly at a distance, from another floor or room in the house. Audience members can now try and find the source of the singing, following the trail of the voice until they ultimately come to the singer, accompanied by the sound of the piano through the speakers. The exploring listener listens in a different manner, combining voice and piano in an exploratory way that can lead to a new interpretation. It goes without saying that the singer’s and pianist’s interpretation in this unfamiliar setting requires absolute concentration: There is no eye contact between the two musicians, for they are not close together in the same room, sensing each other’s presence or breathing together. Thus the video artist combines images and live music in a video artwork. Wim Lambrecht has presented the idea of the singer as femme fatale through the character of Salome. The head of St. John was brought to Salome on a platter so that at last she was able to kiss him, beheaded. This was not about love, but about power: A gender theme par excellence! Are love and power not secretly interwoven in countless nineteenth-century romantic poems and consequently in the lied, too? Was this not the very question regarding the two artistic couples this research project focused on? Who held the power: the composer Robert Schumann, unable to perform as a pianist after a self-inflicted injury which paralysed his hand; or his wife, a piano virtuoso, celebrity, who was enormously popular with the public, especially when she performed pieces other than Schumann’s. Who held the power in the Gustav Mahler and Alma Schindler relationship? Why did he forbid her to compose after their marriage? Why was she only allowed to merely copy his music? Is this how he tried to tie her to him? It was she who held power over the world through her wide and open outlook on culture, her passion for art, which she combined with flirting and passionate affairs with lovers, all of them artists. The head of St. John the Baptist becomes the head of the singer, presented on a television screen on the platter of the piano. This is just one example of the many ways in which the utilisation of video can bring a new dimension to lied, not only when space and spatial separation is concerned, but by inviting, even forcing the audience to listen in an entirely different way. This report clearly indicates that the singers were challenged in many ways to interpret the lied differently than before. Unusual, strange and extreme circumstances put great strain on rehearsals, concentration, communication, open collaboration, and mutual respect and understanding. First, classical music’s unfamiliarity with the video medium had to be transformed into an exploration of each other’s discipline, and an investigation into the possibilities and opportunities both artistic disciplines have to offer. It is a matter of fact that this kind of project requires a greater effort from the singer than mere familiarity with sheet music, and performing after studying and rehearsing with the piano. How can a singer be convinced to perform in strange and difficult situations, including voice-blocking activities? This is only possible because the whole group of researchers and singers have understood that this research created a surplus value, including many playful elements, and that multidisciplinary collaboration opens new perspectives regarding the interpretation of the lied. All of these elements can feed a singer’s interpretation, bring out new possibilities, and make clear that the future of the lied lies in interdisciplinarity. Surely, the musicians must have felt that the lied’s audience is old and grey, but that, precisely through these experimental settings, they can reach out and appeal to a new, younger audience. After all, the lied itself is not old and grey, but, as this project might have contributed to, can be reborn as a contemporary, up-to-date genre. After In Tränen unendlicher Lust2)The remaining text has been co-authored with Wivine Decoster. For Ana Naqe, mezzo soprano in both the previous lied project and in Seelenvoll, the experience did not only concern the voice but also ways of thinking about singing on stage, about communication with the public and even about changes in her appreciation of certain composers, Mahler for instance. Looking back at the project, Steven Marien thought about two very important aspects: The link between technique and challenge on one hand, and the unlimited possibilities you have in the interpretation and staging of a lied on the other. For the expression and the creation of the image on stage, it was also very inspiring not to start from the text and the interpretation of the text, but to have paintings and art works as examples of related situations and expressions, which encouraged the singers to think about a lied in a completely new way. Although this approach to a ‘dramatized’ lied is rather extreme and has had to endure a lot of criticism, both Ana Naqe and Steven Marien feel that it is absolutely necessary for them to continue with this kind of experiment. Michel Stas, who is a well known pianist and lied expert, was one of the musicians participating in all the three projects: In the Lied project In Tränen unendlichter Lust, in the ongoing project Seelenvoll, and also in the first production of the lied class (see below). When he was first asked to participate in the lied project In Tränen unendlichter Lust, Stas was very sceptical about the idea of adding theatrical aspects. For him, the experiments certainly resulted in profound changes in his concept of lied. He now feels himself ‘teased to approach the sound no longer as an abstract medium but in a plastic way’. Earlier, images provoked by the sound of his piano playing were restricted to his own memory, more or less in an autobiographical way. Now he considers it as an enrichment to be able to link all kind of images to the music, and he uses those images as a tool for his performance of the music. Moreover, he became aware of the importance of the inner feeling of movement, which became a kind of translation of the movements of the singer into an invisible inner movement of the pianist, which, in a research context, could be referred to as ‘embodied’. As a consequence, Michel Stas learned to work with the singers whilst avoiding every conventional or clichéd movement. All such conventional or technical movements were replaced by inner feeling: Breathing together without looking, and feeling the singer’s breathing behind his back without seeing him or her, and so forth. And then the complete opposite happened in another theatrical approach: The pianist being face to face with the singer, when they could maintain eye contact all the time, a situation that was also a discovery of great potentiality for the expression of the performance. Michel Stas is absolutely not convinced that ‘anything goes’ or everything is possible. Stas does not like electronic instruments or electronic equipment, headphones, and loudspeakers when he is making music. For him, the contact with a singer ‘long distance’ through a microphone and loudspeakers is not an option, although he had to do it, and was more or less satisfactory during the project. In the lied class, Michel Stas has worked with four piano students during the past year. From the first moment he realised how difficult it is for them to understand the complexity of the lied and the task of the lied pianist to make the part more than mere ‘accompaniment’. These pianists not only worked together with the singers, but also were present in ‘movement classes’ with them. This made them think in a very open way about lied, which was no longer restricted to focusing on the piano part. The singers were enthusiastic about the intense moments of rehearsal with the pianist, Michel Stas, because they could find concepts other than those that arose when they worked only with their singing teacher. 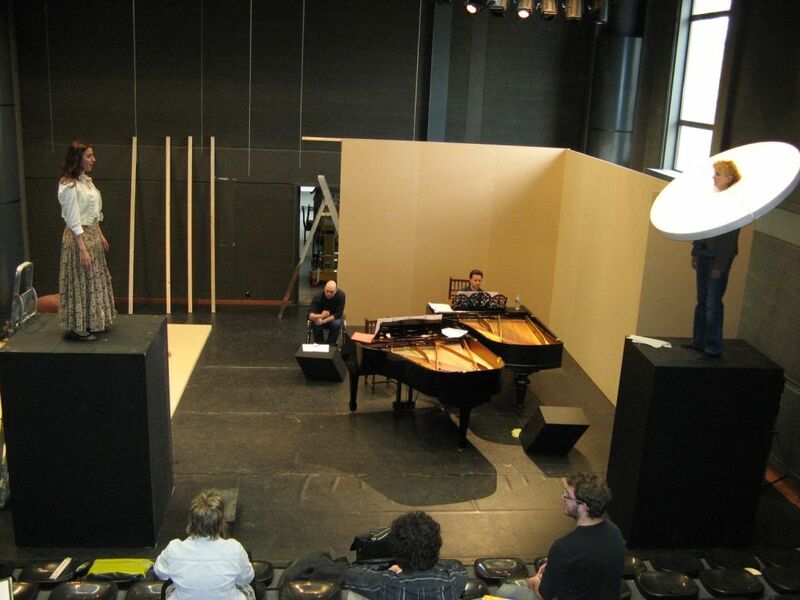 The result in the first stage production of the lied class concerned not only the singers’ acting, but also the pianists, who in turn played a lied and joined the group of singer-actors. Michel Stas is convinced that the addition of movements, play, and action makes singers feel much more emotion in their art, and enables them, as a consequence, to show much more expression in their interpretation. To Stas, the traditional presentation of the lied is not old fashioned, but still keeps its importance and value. However, he has experienced that singers, after being involved in a performance project, perform much more freely and behave in a different way when they return to the traditional settings of lied presentation. It is of great value that results of research projects can be implemented in the curriculum of the conservatoire. One of the permanent outcomes of the lied project In Tränen unendlicher Lust is the organisation of a new lied class (second year master level) within the singing/voice department of the Lemmensinstituut in Leuven, where Lieve Jansen teaches. The lied is here considered both as a musical and a theatrical genre. The original ‘setting’, the intimacy of the salon with a small public, which was almost in an ‘interactive’ contact with the singer, made the salon function as a decor for the lied, whilst the public became part of that decor. Students of the lied course do not only learn to sing and perform lieder, but also have to think about the setting of their recital. They have to think about the ‘space’ that will be occupied by the singer, the piano, the pianist, and the public. All this means that the singers have to think in a theatrical way, for instance starting from diagonal lines or directed movements in the room. Moreover, through their performance, they have to explore how they can communicate with the public, and how they can effect an emotional expression and have an emotional impact. What are the solutions for the fact that the public does not understand the text, because of the singer or because of the language (texts in German, besides in French, English, etc.). Thinking about a broader valorisation of the results of the lied project and of the lied class, the students have to try to surprise and keep the attention of a public that is not specialized, and even unprepared for classical music. And of course, because more than one type of listener, not only the expert, is bound to be very sceptical, in every moment, and in every action, the performers have to be aware of quality and the possible loss of quality if too much attention is focused on the scenic elements of the presentation. And what about movement in the lied course, after the lied project? In opera and in other musical styles, such as rock and pop, dance and movement are accepted as part of singing. Is it possible to work out the idea of movement in relation to lied, perhaps by allowing the singer to walk around? Is it allowable to use lighting, coloured lights, and even moving spotlights? Movement in the music itself, in the melodic and rhythmic shape, and in the text can be sources for the creation of movements by the singer in space. Students learn to feel their own body, to feel the relationship between their body and the space they are working in. For a critical reader, all these ideas can provoke the reaction that it is all about context and not about the lied itself. But, as mentioned just above, the movement that will be ‘exteriorised’ is in fact present in the music itself. On the same level, the lied course will start to work out a lied through a very critical approach, and a musical one at the same time. Analysing the music, not only the melody of the singer, but also the piano part and the relations between both, analysing the text, looking closely at the interaction between text and music, between singer and pianist, experimenting with the timbre and ‘colour’ of the voice, all these new elements are taken into consideration in order to prepare a convincing performance that combines with new ways of using space and communicating with the audience. The first production of the lied class was a performance with eight singers and four pianists: 1940—1945 — Songs in a turbulent time of the world history. On the programme were songs and lieder by composers of different nationalities: Britten, Finzi, Weill, Barber, Korngold, Shostakovich, Argento, Honegger, Poulenc, Messiaen, and the Flemish and Belgian composers Absil, De Vocht, Lonque, Ryelandt, and Van Hoof. In the space of one hour, songs followed without any interruption, with no possibility for applause, apart from when the public was so impressed by the performance of a song that it erupted spontaneously. The singers and the pianists were on stage all the time, acting together in the ‘theatre of war’. The action was mostly focused on the behaviour of people in a war situation: A woman dying of grief because she missed her husband; a girl drinking too much to forget she was alone; boys and girls thinking only of having fun and dancing to try to forget the problems around them; looking to find a lover and ‘falling into the arms’ of the first passerby; the cynical reactions of people in despair; a woman driven mad by the whole painful situation, and so forth. The different reactions and feelings caused by war resulted in a fascinating visual presentation. The war was ‘present’ in the sound of sirens and the complete darkness with flashlights at the beginning of the show, as in a bomb-shelter. The musical selection was not based on the simple fact that a song and a poem had war as subject, but rather that the performers looked mostly for songs composed or first performed during war years, not without some exceptions such as Argento. Of course, as they are all conservatory students, they also had to consider the difficulty of the lied and the duration of the spectacle. In the experience of Michel Stas it was a big challenge for both the singers and the pianists, with a nice result that promised future developments of the class. Video artist Wim Lambrecht ran a project with singers across 2010 and 2011, and is now working again with the singer Ana Naqe and the pianist Michel Stas, and with a new singer — Jean Bermes. The most important new research partner is Lieven Jonckheere, psychologist and psychoanalyst, member of the New Lacanian School. His role is not only theoretical support, but also research within his intellectual expertise. The project is made possible by the funding of the Faculteit Architectuur en Kunsten (FAK, Faculty of Architecture and the Arts) and the KU Leuven Association, founded in 2010, where the IvOK was integrated. This time the lied composers in the picture were Gustav Mahler and his wife Alma Schindler. The project was called Seelenvoll after an indication by Mahler on the score of the ‘Adagietto’ of his Fifth Symphony. The central aims of this research project have not changed from the earlier one. The researchers seek for new possibilities in the presentation of the lied, possibilities that can be interesting and inviting for the public. Starting with the human voice and the behaviour of the singer on the scene, the mise-en-scène is designed to encourage the public to feel a new experience. The audience is no longer only listening, but also looking, feeling and empathizing. The difference from the earlier lied project lies in the Lacanian question of how a contemporary musical and scenic performance practice can be based on and influenced by a psychoanalytical dramaturgy. What can be the conclusion of this interdisciplinary, collective, and dramaturgical approach? How is it possible to exteriorise the intimate and organic creation of an artist? For Lacan, psychoanalysis preferred visual over auditory sense experience. As a consequence, the Lacanian vocabulary was much more orientated towards visual aspects. In this context, the voice was historically considered as ‘a terrifying non-organ’. The voice provoked anxiety, took on the appearance of a seducer and became a dangerous weapon. At the end of the nineteenth century, the voice was linked with the lied and even more with the opera, wherein it was involved with dramatic situations, almost always ending in a tragedy. The singing was extremely seductive, with death as the ultimate consequence. And yes, Mahler visited Freud and yes, his marriage with Alma was unhappy. The results of this project will be known by the end of 2011. There were concerts and performances in cooperation with the Festival van Vlaanderen in Ghent and Kortrijk, and lecture performances and meetings with experts, which included discussions about theory and practice, performance practice and dramaturgy. 1. Both disciplines (singing and voice science) experienced a more in-depth knowledge and more comprehensive understanding of their own discipline. For the singers, the well-known world of holistic auditory evaluation and feedback has been documented by means of analytic visual graphical representations with reference to their singing practice. For the voice researchers the real, authentic meaning of ‘variable’ became much clearer concerning not only the kind of variables applicable to singing in addition to speaking, but also the subtle variation of these variables in singing, and their differential effect on vocal sound. 2. During the project singers increasingly considered acoustic analysis to be an essential tool for several aspects of their learning process: in the translation of the singing teacher’s instructions into the intended physical activities; as feedback from their performance, and in the exploration and fine tuning of all possible variations in their singing activity, resulting in remarkably intentional and controlled functional choices for technical and artistic singing. 3. Singers and researchers who had been attending rehearsals, performances, and lectures during the project were positively surprised about the process and the outcome of the interdisciplinary cooperation with which most of them where unfamiliar. Their comments revealed that this cooperation had been successful in terms of accessibility, relevance to both art and science, and innovatory with respect to long-term and widespread application. These findings resulted in the planning of a new project with the focus changed from supporting the process of an art project to supporting the development of the didactic aspects of the learning process of classical singing students. This redirection towards research in education was based on the conviction that singing students must be offered the opportunity to benefit from the acoustic analysis of the singing voice during their studies, and not only as an exotic short term experience during their career. For many singing teachers this argument has been far from self-evident. Some of them have had difficulty in changing their pedagogical approach, because acoustic analysis is too unknown to be implemented in their teaching, or because of the belief that visualizing the voice inhibits the development of listening skills, and only provides students with technical tricks that are irrelevant to artistic performance. Therefore only the singing teacher from the previous lied project was involved, and singing students were invited, not obliged, to participate and were allowed to quit the project as soon as they felt disconnected with its practice and purpose. Lieve Jansen and affiliated researcher Wivine Decoster are conducting the project. As the project was not granted sufficient support, the acoustic analysis is being done by two skilful students in Speech Language Pathology (SLP) in the framework of their Masters thesis concerning the topic of the project. As a first step in the project, student singers were extensively informed about the acoustics of the voice. This was crucial because the participants did not have the experience of acoustic analysis that the singers of the art project became familiar with, and because this topic is not studied in the regular curriculum of the singing students at the Lemmensinstituut. During the lessons in classical singing, the singing teacher gave individual lessons to one student while one or more other students observed, allowing them to learn from different approaches, skills, instructions, techniques, interpretations etc. For the project, the SLP-students attended these individual lessons, equipped with a professional microphone, a digital audio recording device, and software for the acoustic analysis of the voice. Two software packages were combined: Voce Vista, which provides real time spectral analysis of the voice in terms of fundamental frequency and overtones, combined with PRAAT, which enables detailed analysis of temporal, intensity, and speech sound characteristics. For the PRAAT analysis the voices are registered and analysed afterwards. Information from both types of analysis were combined, and thereby provided real time (immediate) feedback, which proved ideal for teaching purposes. However, no software package is available that integrates all acoustic features in real time analysis. As soon as the singing teacher considers an acoustic analysis to be beneficial for a student, the screen with the real time spectrogram (Voce Vista) is shown to that student, highlighting a particular point of interest about their singing and the instruction of the singing teacher. The combination of instruction with visual and auditory feedback is intended to enhance the learning process in terms of the physical activity of muscle activation for posture, breathing, phonation, and resonance. Shortly after the lesson, and after having analysed the registered voice samples by means of PRAAT, the research students discussed the acoustic features of his or her voice with each singing student. In order to intensify the learning process, all participants received a research version of Voce Vista and were asked to download PRAAT from the Internet. They were instructed in how to use the software while practicing at home, and were asked to fill in a diary about the usefulness of the procedure, the frequency, the benefits, the difficulties, etc. All kinds of feedback from all the participants in this on-going preliminary and exploratory study (singers, singing teacher and researchers) will be analysed and summarized to answer questions about the pedagogical-didactic value of acoustic analysis for singing education, and about the need to implement this approach in the regular curriculum. This project tries to give the singing students and professionals the necessary tools for controlled, comparable and repeatable singing acts. As such, it enables them to minimize the fear of many performers that is expressed in Sir Laurence Olivier’s quote ‘I know it was wonderful, but I don’t know how I did it’. 1, 2. ↑ The remaining text has been co-authored with Wivine Decoster.